Here it is more than 1/2 way into the first month of 2019 and I just noticed it’s been a while since I posted here. Like many New England based Sound Mixers, I am doing my best to stay warm and fill the unbooked days with other work, while I wait for the weather to clear and the phone to start ringing. And I have faith it will start ringing. In the meantime, I am filling my time with personal projects, gear upgrades and the occasional Post Audio gig. My first “official” gig of 2019 was a quickie podcast. Later this month, I will be working a day on Alexander Freeman’s Indomitable. Working with Alexander on this film has been a labor of love and inspiration for me. I am looking forward to another day with this inspirational Director. In the meantime, have gear and willing to travel to the lower latitudes for work! So, I’ve been in Boston since the 27th of September. 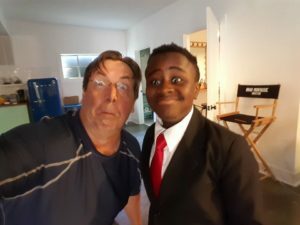 Within 4 days, I was able to book a 1/2 day gig in Beverly (north of Boston) , then ended up going back to Huntsville, AL to finish up a Pilot with ITV/Leftfield Entertainment. Today, I was able to lock in two days in N. Kingston, RI. All this and I haven’t even really started my marketing campaign to let the LOCAL community know I am in town. I think my promoted listings with Production Hub and Staff Me Up have been really helpful in landing gigs. I am hopeful this is a sign of how things will be for me here in New England. One can hope. I can’t wait to see what happens when I start promoting myself locally. It’s been a while, but I finally updated my resume and uploaded it to my site. Check out the Services page for a link or click here: Steve Baker Sound Guy Resume. What do a Princess, a Totally Blind Race Car Owner, Civil Rights Lawyer, News Anchor, Record Producer and Psychic all have in common? They are among the first 10 “Interesting People I Know” who will be featured as part of this little podcast I’m doing. Stay Tuned for the first episode to be rolled out very soon. After the June I had, it has been nice to have a few days off… but not really. Tomorrow, July 30th, will be the first gig I’ve had since the end of June. And, while the rest was welcome, I’ve been a little concerned that people have lost my number. A quick poll around the different on-line communities I belong to, and several phone calls to other freelance friends confirm something I already knew… June has been a slow month for everyone! So I’ve been working on some things around the house and office that have sorely needed attention. Mostly doing minor maintenance on my gear, editing my movie (Uncle Bob’s Leg) with the help of my buddy Jon Deckert and coming up with other things to keep me occupied. While staring at the screen the other day a flash of an idea came to me… something that has been gestating for quite some time, and I think it is time to execute it. Over the years I have met a lot of interesting people in and out of this show business thing I call a Job. I made a list of interesting people I have met along the way… then I made a list of interesting people I have met in my lifetime. Frankly, it astounds me how many interesting people I know… people who wouldn’t think they are interesting, but they are. Famous people, nearly famous people, and people who are famous, but you wouldn’t know them if you passed them on the street. So what I’m going to do is start a little interview blog, right here at SteveBakerSoundGuy.com. Have little chats with them about who they are, what they do and how they got to be where they are or are not. So, if you’re interesting, expect a call from me. If you interested, stay tuned. I’m using this post as motivation and commitment to actually do this one. Stay tuned folks…. and until the next one..